8th: You do make friends with salad – A salad to win anyone’s heart. Salads can be very, very sad things, but they shouldn't be. A good salad is an absolute delight, and can range from a simple side salad to a meal-sized salad packed full of flavours and textures for a more filling meal. Salad Samurai by Terry Hope Romero is a must for any salad lover. The book is divided into salads for each season, as well as an additional 'Sweet and Savoury' chapter. You can see what else I have made from this book here. 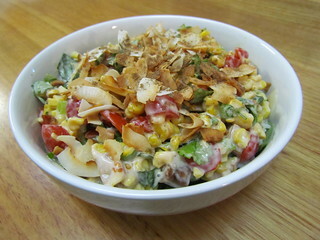 East West Roasted Corn Salad (Summer): This is a creamy, sweet corn salad. It is meant to be a bit spicy, but I only used a smidge of sriracha for a gentle heat. You can make your own cashew dressing or use vegan mayo. I only had a jar of Melrose mayo to use up, which isn't really that good, so that is not the salads fault. Vegenaise forever! As well as corn, the creamy dressing also coats coriander, basil (I used regular), lemongrass tofu and tomatoes and is topped with some garam masala toasted coconut. I also served this over some brown rice with some baby spinach. 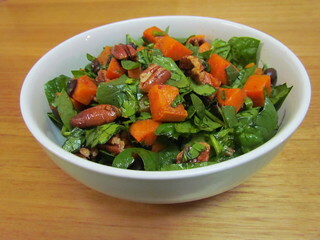 Spinach and Sweet Potato Crunch Bowl (Fall): The green here is meant to be collards, but we don't have those here so I subbed chopped baby spinach instead. This is such a lovely combination! Roasted sweet potatoes, black beans, Sriracha & Smoke Pecans and a lovely smoky orange vinaigrette. The pecans are very easy to make in the oven. I made a third of the recipe to serve with the salad, and I decreased the sriracha for a gentle heat only. I served the salad with some hot fresh bread rolls, which were great for mopping up leftover dressing from the bottom of the bowl. 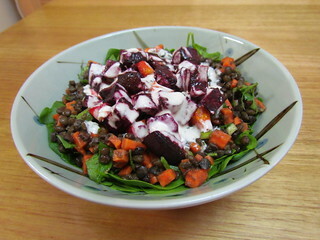 Gingery Beets & Lentils with Tahini and Agave Nectar (Winter): This salad is just a fabulous combination of flavours. The beets are roasted and tossed with lentils, carrots (which I also roasted), lots of parsley and a ginger orange vinaigrette. I cut down on the oil in the vinaigrette a little so it wasn't too oily for me. Then it is all drizzed with delicious Lemon Tahini Dressing and some dark agave. The lemon tahini dressing is super easy to make, and quite delicious. I only ended up needing about half the recipe for this, but it was more than OK to have leftover dressing on hand. I served it all over some baby spinach. Avocado Tofu Breakfast Bowl with Carrot Ginger Dressing: Salad bowls for breakfast? Yes please! Corn, cherry tomatoes, black beans and greens make the base of this bowl, tossed with some Carrot and Ginger Chia Dressing. I also tossed through a bit of leftover quinoa I had. 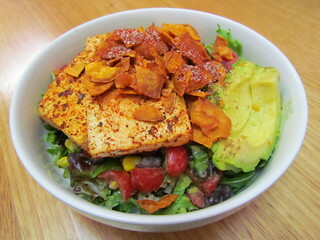 This is topped with avocado and a Smoke & Spice rubbed tofu. I only needed half the amount of rub to coat my tofu, and I found the tofu on its own a little bitter and dry, but all is fixed when it comes together. It is all topped off with crushed sweet potato chips. The carrot and chia dressing is drinkable, and super easy to make. Nothing was safe from Sahara making a bed on it, she loved all the layers to be underneath her. 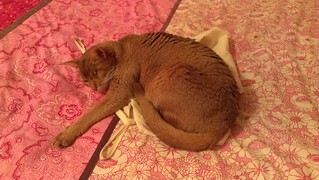 Anything left on the bed, be it clothes or an empty laundry bag (as seen here), she would make it her snooze spot. I love this book so much! The breakfast section is my favourite, even though the idea of a breakfast salad really disturbed me at first! Breakfast salad does sound... weird. But a breakfast bowl is much better sounding. I need to make more breakfasts from here. That breakfast bowl looks like the type of breakfast that I would want. Funny thing is that I gave this book to my sister because I thought it would be a good vegan book for a non-vegan. It has her favorite potato salad recipe! And my Mom loved it so much that she bought her own copy. I definitely think this is a good book for omnis, even though it might not seem like it. Salad? What? But the salads are so good and exciting and tasty, everyone has always loved them. The breakfast bowl definitely looks fun; I'm pretty sure I've never had a salad for breakfast before! It was great. Tofu and avocado are an excellent way to start the day.